Every once in a while an image is produced when right after you took it you say to yourself… “well, that was a nice effort but I guess I’ll try it again” as you look at the cameras LCD display in disgust… Well maybe in not so many words. That was exactly what I thought when I took this image back in late March of 2012. Handling a DSLR camera was at the time new to me. Prior use of a DSLR included my mother’s Canon T2i a couple times and a Pentex K30 from a friend which I had nicknamed the “Stormtrooper” for its white and black appearance. Most of my previous night, low light photos had been done using a point and shoot camera. Mostly a 12.1 MP Panasonic Lumix DMC -ZS7. I had only picked up my Canon T3i earlier in the month. The location on the railroad is known as “Hobbs.” As stated previously, it is the top of a grade where up until the early 2000’s required helpers on heavy loads. This was the western terminus of stretch of three track mainline and also had an interlocking tower designated “RN.” Today, it’s just another spot on the railroad, like most other former locales like Engles Switch, Hansrote, Magnolia and Sir John’s Run. Locations that once were pivotal to the operation of the Baltimore and Ohio Railroad, the lines builder and original operator. I parked the car and beat the train easily as it called out the Kearneysville signal some 3 1/2 miles away. Standing on the shoulder of the bridge looking around I looked for the right composition and began playing with the settings. It had been kind of a blah day weather wise as it had rained during the day and it had just began to clear up before the evening. The Sun began to set and after a minute illuminated the cloud banks in the sky as it did. “there goes my light.” I muttered with the train approaching the next signal away from me. Now it came to crunch time as I began playing with different settings on the camera. I had not yet installed Magic Lantern on the device as I do now which gives me a little more flexibility with settings not normally available in manual on the T3i. Q216 rounded the curve about quarter mile ahead of me and the headlights illuminated the tracks. As it grew closer I kept taking tests shots. Not being satisfied, settings were changed. Finally, in the fading light, CSX engine 8575 drew near, a small toot of the horn as the crew acknowledged my presence and I fired away as the train crested the hill and rolled beneath the bridge splitting the signals. Getting home, in disgust I loaded the photo on the desktop and began processing. Adobe Lightroom is the software I use to process and edit my photos. At the time I had only had the program for a month so my understanding of it as a tool was limited at best.As I worked with the photo though it began to come to life. Instead of disgust, the feeling of accomplishment overcame me. To this day, it is one of my favorites. It has again been re-processed using Lightroom 5 for upload to my site and this blog. DUSK AT HOBBS: CSX Q216 reaches the summit of the upper Shenandoah Valley at Hobbs on the Cumberland Sub near Bardane, WV on March 28, 2012. 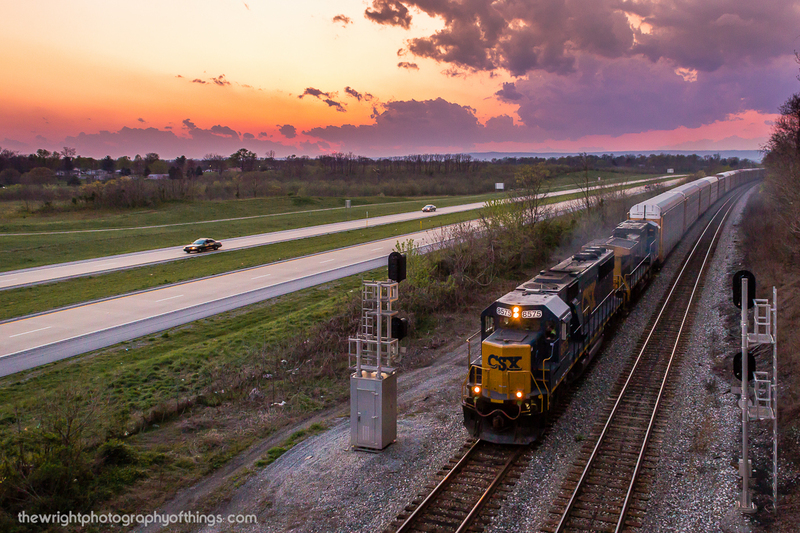 Rain clouds loom in the distance as the sun had set over the horizon about ten minutes prior to the trains arrival. The train with CSX SD50 8575 leading runs alongside the West Virginia Route 9 Freeway for a few miles between Kearneysville and Shenandoah Junction. The bridge where this was taken is popular among local railfans as it currently only leads to an orchard the the highway separated when it was built and sees very little use. My 12 year old son and I ventured out on a recent Saturday night to catch Norfolk Southern’s Pennsylvania Railroad Heritage unit 8102 leading a manifest through the area at nearby Sharpsburg, Maryland. Photographing signals such as the former operations’s Norfolk & Western Color Position Light (CPL) signals in the area has become a hobby of mine. Their days are becoming numbered as NS has begun in recent years replacing them with newer standardized varieties, most recently just six miles to the south at Shenandoah Junction, WV in November of 2014. The Norfolk and Western CPL at Shepherdstown, WV displays a clear indication for Norfolk Southern train 15T on the railroad’s H Line. The constellation “Orion” can be seen to the right. I arrived in town from just across the Potomac River just before midnight and the southbound signal was lit up green which gives a “clear” indication for a passing train. After seeing the indication and the star field behind it, I began taking a series of long exposure or “open shutter” photos. Finally coming across a composition that I was happy with, I began exploring the scene even further. I had visited Shepherdstown countless times and each time always seems to provide another angle I had not thought of previously. Soon after the southbound passed a “Diverging Approach” (red over diagonal yellow) signal lit, meaning another southbound was approaching, but instead of going straight, would go onto the passing siding on which the CPL’s here protect. The train (213) arrived but I almost missed it. Being cold, I sat in the car to warm up after setting up and was having a conversation with my son. Soon there afterwards, Evan brought it to my attention that the trees were lighting up and asked if a car was coming. I immediately jumped out and turned on the camera just as 213 arrived, switched and waited in the siding as 12R approached from the south. I was happy with the composition I had found when 213 arrived but again, something was missing. I could hear 12R blow at the road crossing just a couple miles away. I managed a couple test shots before it turned the curve and finally it hit me. 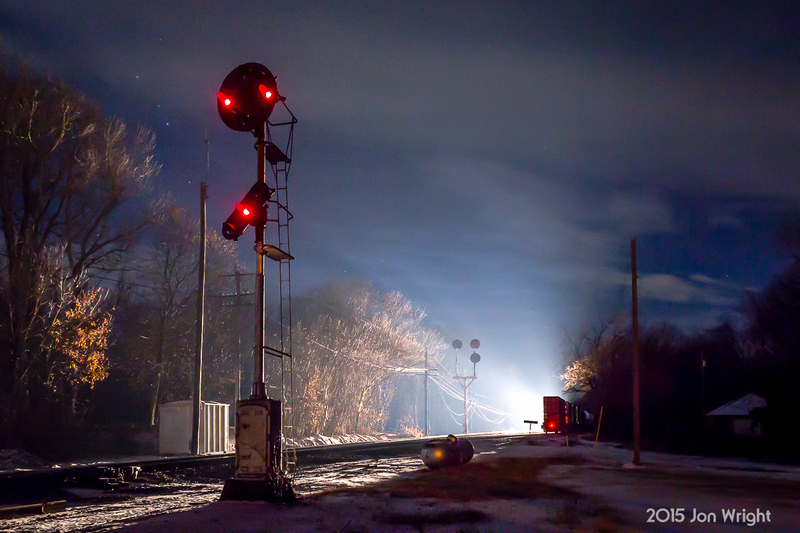 back in September, I photographed a scene at Shenandoah Junction of on oncoming train illuminating the right of way and tracks between it and I as well as silhouetting the train in the siding with it’s “end of train” device lit. I quickly adjusted my ISO to 640 (was previously set at 400) and aperture to an f-stop 6.3 for more detail. 12R lit of the foreground and behold the scene developed before my eyes. I took 3 shots at 10 seconds, 7 and finally 4. Of the three, the final shot proved to be the winner. Pictured below is the final product. Standing in the 10 degree heat with the light snow on the ground I believe made the image pop. At another time, say in the Summer may have had a different effect. What you see is the rear of train 213 sitting on the siding adjacent to the northbound N&W Bracket CPL Mast signals as the the still air and tracks shine. the southbound displays a “restricted” or stop signal and fills in nicely in the foreground. This scene will undoubtedly change in the future. How soon, I do not know. I am just glad I was able to be there to capture it and share it with all of you. It’s a very chilly 10 degrees at Shepherdstown, WV as 213 sits in the siding to meet the incoming 12R.